I tried an experiment this week while searching through recipe ideas for what to bring to my family holiday party on December 30th. Originally I was debating putting a charcuterie platter together, when suddenly my desire shifted to a sweet, soft, crumbly bread. However, I still plan on putting together a charcuterie platter soon! I also applied mise en place to the making of this recipe. Why I don't apply this concept to all of my meals, I have no idea. I want that to be a goal of 2018, as mise en place makes everything so simple, quick, and effortless! Mise en place is a French term for having all your ingredients, utensils, etc. prepped before starting the recipe. Everything is at your fingertips. Everything is measured out. I always avoid it thinking it will make the recipe take longer, but trust me, it is the ideal way to tackle a meal-making project! This recipe I originally found on The Minimalist Baker. While the original recipe is vegan and gluten free, what I ended up making is not, as it contains spelt flour. So for those who need to stay away from gluten, substitute some gluten free baking flour. The bread looks like winter in a dish to me. The darkness of the bread is refreshing from the norm. 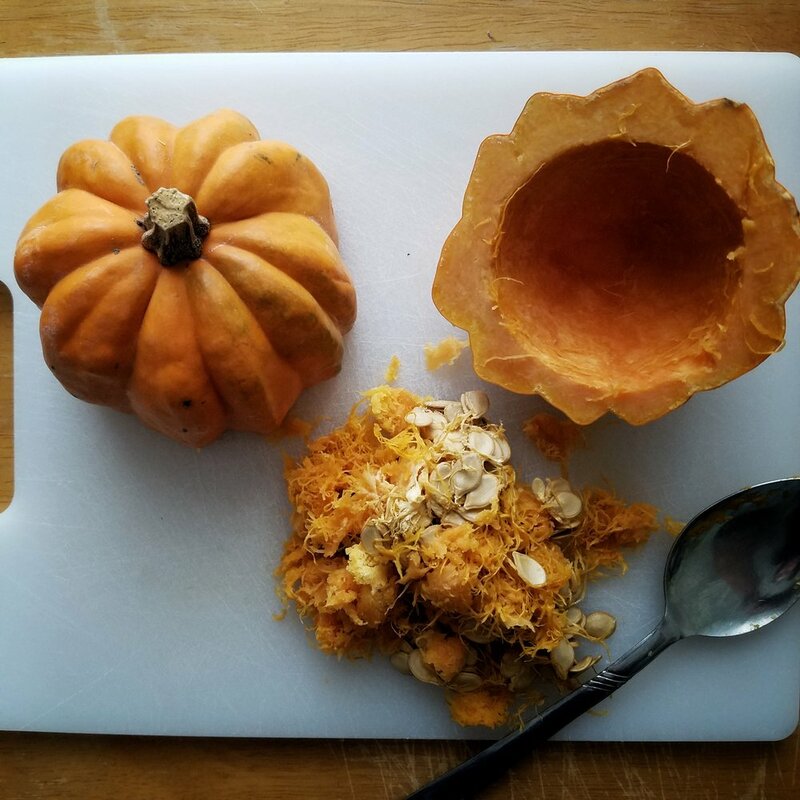 Instead of using pumpkin puree, I roasted an acorn squash for 40 minutes. This gave it a depth of flavor that's unique and delicious while retaining sweetness. Enjoy! Mix flax eggs in a large bowl. Preheat the oven to 375. Line a loaf pan with parchment paper. Add acorn squash, banana, maple syrup, and olive oil to flax eggs, and whisk to combine. Next, add the coconut sugar, baking soda, salt, cinnamon, and pumpkin pie spice and whisk. Add the water and whisk again. Add in the oats, almond flour, and spelt flour and stir. If it appears too wet, add in a couple tbsp of oats or spelt flour. Scoop into the loaf pan and top with pepitas. Bake for 45 minutes until deep golden brown. Remove from the oven and let sit in pan for 20 minutes, then gently transfer to a plate to cool. Let cool completely before slicing, as it can be crumbly. Slice gently.